This brilliantly handcrafted Amish Ava Hutch is full of customizable options and ample storage space to fit your dining and household supplies. Choose your own doors, hardwood type, finish and hardware to match you're home and personal style. Call our Amish furniture experts today to discover more about this beautiful solid wood hutch. Proudly made in America by our talented Amish artisans. Be sure to also check out our other many handcrafted Amish hutches and corner hutches. 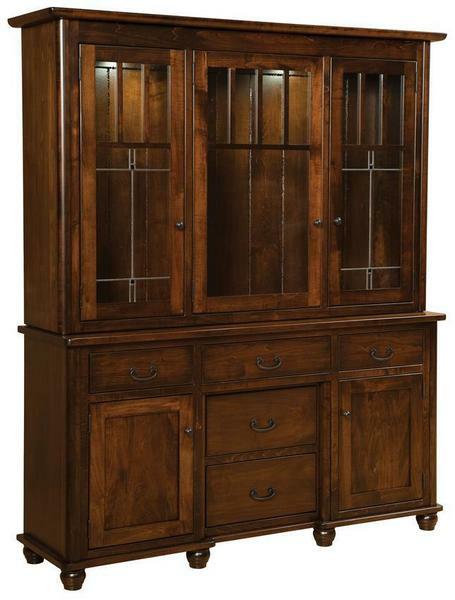 This hardwood hutch is shown in brown maple wood with our popular rich tobacco stain. Choose the same wood and stain combination or select a custom combination that best fits your style and home decor preferences. Finish samples are also available upon request to help make your custom ordering process a bit easier. Same as this hutch shown without the top middle glass door and the three middle drawers on bottom. 3 Door Open Hutch with 48" width is standard. Call for additional doors options. Closed Hutch is shown in Brown Maple with Rich Tobacco stain. We use this piece as a bookshelf, with the bottom filled with glassware and serving dishes. It's a beautiful piece and we like it a lot.